Bricoleur Vineyards is a boutique family winery and high-end event venue producing ultra-premium quality wines from its sustainably farmed estate vineyard in the Russian River Valley. Introduce Bricoleur Vineyards as an ultra-premium winery and sustainable farm. Attract customers seeking a rustic, welcoming, luxurious venue for high-end events. Facilitate online sales and joining the wine club through integrated ecommerce. Provide convenient means to book events, tastings, and guest house rentals. Communicate Bricoleur’s commitment to environment, community, and heritage. Roll out components of the website over time, in line with planned phases of diversification. 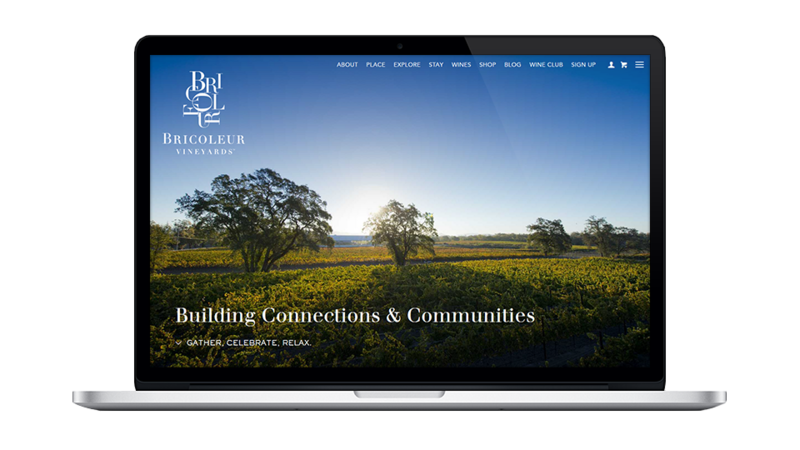 We could not be happier with our Bricoleur Vineyards website! Vin Agency took our vision and made it happen! They took the time to listen to us about our business and our goals for the website which helped to make sure we were giving our customers the best experience while exploring on our website. Jon and the team were easy to work with, responsive, thorough and extremely helpful. We highly recommend Vin Agency.